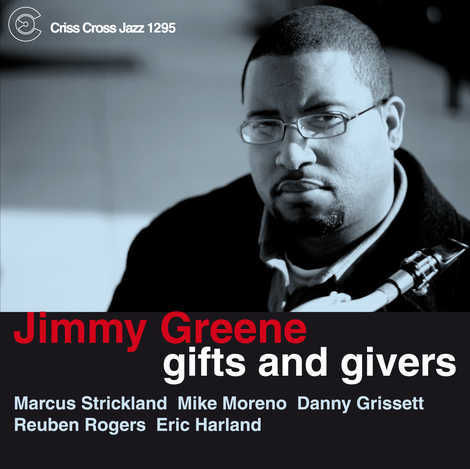 Seldom heard since the days of Eddie "Lockjaw Davis" and Johnny Griffin saxophonist Jimmy Greene joins forces with Marcus Strickland for a two tenor line on his fourth set as a leader for Criss Cross. 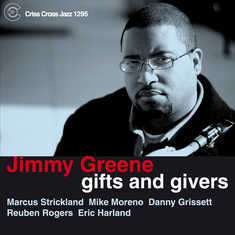 Easily his best album to date, Gifts and Givers crackles with excitement on a program of originals and iconic standards such as Sonny Stitt's "Eternal Triangle" , John Coltrane's "26-2" , and Kenny Dorham's "Blue Bossa" , taken here in 7/4. Supported by veterans Reuben Rogers and Eric Harland, our horn men are also joined by two up-and-coming talents, guitarist Mike Moreno, and pianist Danny Grissett.